What Are You Getting From Your Current IT Solution? When you are examining your current IT solution, it can be difficult to figure out whether or not you are in an ideal situation or if maybe you could use some help. There are many different facets to consider when thinking about potential IT solutions, so to help you make the best decision for you, let's take a look at some of the questions you need to ask yourself. What is Your Current Cost? How much do your current IT solutions cost you? What are the results compared to those costs? We want to focus on the level of productivity versus downtime. What about the risks you may be exposed to? If you are not proactive about the potential risks you may face in the future, like say a system that crashes, do you have current processes that will prevent revenue loss? If you are currently outsourcing, does the vendor meet your needs? Remember, productivity is your biggest expense as a business, so you want to make sure you get the most out of your employees. If your systems go down, you lose productivity and therefore end up paying for people that aren’t productive. Does Your Solution Work for You? 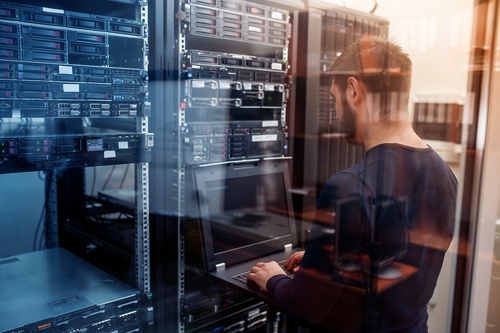 If you have an enterprise level tech environment and your fiber-connected equipment goes down, you are probably better suited for a full-time IT staff to ensure minimal downtime and maximum productivity. On the other hand, if you have a medium-sized business, you may or may not have the resources to have a couple of people on your IT staff. In that scenario, it may be better to outsource your tech support from a vendor. Smaller businesses are even better suited to having an outsourced provider handling their IT tech needs. Whatever you choose for your business, always take into account downtime and current processes in case something were to happen. With every bit of technology, you run risks. These risks include security risks as well as exposure to viruses or hacking. You need to know what risks you're exposed to with your current IT solutions. If you allow employees to use personal devices, do you have any policies regarding the utilization of those devices on your business network? If you routinely need to use the internet to do research for your business, how protected are you from viruses in your current situation? Knowing the risks cuts down on any breaches you could otherwise face. What Does Your Crypto Management Look Like? As an example to help you understand crypto management, let's say you get an encrypted email at work. To decrypt it, you may have to have a crypto server somewhere on the network, or you may have your cryptography happen in the cloud. How do you manage that? Do you have someone manage it on-site or is it located off-site? Do you have protocols in place to make sure that your cryptography is safe? These are important things to consider especially if you need to transmit confidential, sensitive data. What Are the Costs of Results? If you currently work with a break-fix solution which is reactive, how do you get to the root of the issue at hand? How much does productivity suffer? What would happen if you had someone preventing those problems? What would happen to productivity for you with a more proactive model? Many companies tend to have their policies slightly out of alignment, therefore, inhibiting maximum productivity. Most often, the weak link is due to a reactive stance as opposed to a proactive stance. When you dissect your current processes and compare them to best practices, you can see where your processes may need some adjustment. Be proactive and think ahead how change can work in your favor if you decide to take that plunge. As you consider your current IT solutions, you need to think about what kind of changes can be made to help you ultimately save money, reduce risk, and overall make your life easier.